In a major plenary lecture on transgender health care and rights at the 2005 IFGE Conference in Austin, Texas, HBIGDA's past president Dr. Eli Coleman commented on the �setback� that Bailey�s book had represented in that area, and thanked those who "exposed the book" for what it was. Dr. Coleman's remarks (see report below) were similar to those he made at an earlier HBIGDA meeting in Ghent, Belgium (a meeting of researchers and clinicians experienced with transgenderism) - remarks that were a follow-on to HBIGDA's issuance of an open letter expressing serious concerns regarding the negative impact of Bailey's book. "As he outlined the need to �promote sound and ethical research,� Dr. Coleman made a direct reference to The Man Who Would Be Queen by J. Michael Bailey of Northwestern University. The book has been widely denounced as scientifically unsound and deeply biased. 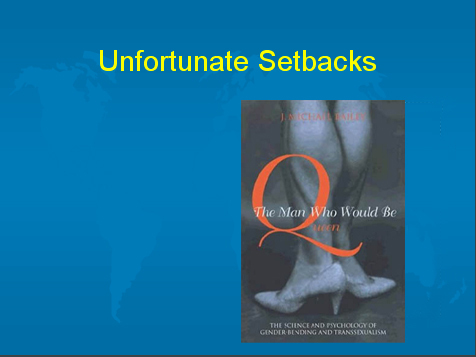 Dr. Coleman urged members to work with the transgender community to �end antipathy and distrust of researchers.� To illustrate what Dr. Coleman called �unfortunate setbacks� to ending this problem, he displayed the Bailey book cover. The book�s provocative title and image of masculine legs and feet in feminine shoes are widely considered to be deliberately insulting. Referring to Bailey�s shoddy scholarship and deeply flawed research methods, Dr. Coleman emphatically declared: �We need to challenge bad science.� "
In the more recent report from Dr. Sandra Samons, below, we learn that Dr. Coleman is now openly rebuking Bailey's book out into the larger public arena, as at this very major gender conference (IFGE 2005), just as he had done earlier within the HBIGDA meeting. These more public remarks by Dr. Coleman signal that the larger research and clinician community is now well-aware of the terrible damage done by Bailey's "scientific" defamation of trans women, and also signals that it is appropriate for them to make their concerns quite public. His remarks further signal to the research and clinician community that it must become much more self-aware and itself more immediately critical of poorly researched, biased, shoddy, so-called "scientific results" that can heavily impact the lives and identities of hundreds of thousands of innocent people - as in the case of Bailey's book. I am writing to tell you about a recent event that I think you will appreciate. You are already familiar with my reaction of shock and dismay when I read J. Michael Bailey�s book The Man Who Would Be Queen. I was astonished that this work, which I thought bordered on tabloid journalism, was being taken seriously in some academic circles. I was convinced that the people who endorsed Bailey�s book had done so on the apparent strength of his academic standing, rather than on careful reading of the work. I shared your concern about the negative influence of its portrayal of transgenderism, which I considered to be inaccurate. I also shared your concern about the possible negative influence it could have on people who might regard an author who is a professor at a highly esteemed university and a publisher like the National Academy Press as authoritative sources of scientific information. Since then, I have followed with great interest the transgender community investigation, lead by you and several others, into Bailey�s activities, along with the expos� of numerous allegations of research misconduct on his part, and his subsequent stepping down as Chair of Psychology at Northwestern University. Recently I attended the 19th Annual Conference of the International Foundation for Gender Education (IFGE) in Austin, Texas where Dr. Eli Coleman gave an excellent plenary lecture entitled From Science to Advocacy: Promoting Transgender Health Care and Rights. This lecture was delivered to a large audience composed of both transgender people and professional people of various disciplines who serve and have an interest in this population. Some attendees identified with both groups. In his lecture, Dr. Coleman spoke about the ways transgenderism is viewed in various parts of the world and the way ignorance, intolerance and bigotry interfere with delivery of adequate health care. He advocated for improved civil rights for transgender people based on sound research that promotes an objective search for truth and concern for humanitarian principles. During his lecture Dr. Coleman showed the audience a slide of Bailey�s book. He referred to the book as an example of a �setback� in our efforts to foster understanding of transgenderism. He then said that we (who I interpreted to include both the transgender population and gender professionals alike) �owed a debt of gratitude to Lynn Conway for her efforts in exposing this work� for what it was. I know that you have worked tirelessly to protect us all from distortions such as those presented in Bailey�s book, and I am sure you will be pleased that this was recognized by someone as highly respected as is Dr. Coleman in the field of human sexuality. As you know, his many accomplishments include his current service as Director of the Program in Human Sexuality at the University of Minnesota and as a former President of both the Harry Benjamin International Gender Dysphoria Association and the World Association for Sexology; he is also the author of numerous books and articles on transgenderism. Although Dr. Coleman�s comments were quietly understated, he gave them a special voice under these circumstances. I am sure you will be pleased to hear about his comments, not so much for yourself but rather as evidence that such respected sources are openly recognizing the negative impact of Bailey�s book, the continuing need for solid research, and the need for vigilance on the part of us all to counter such inaccurate reporting. Please continue with your efforts to promote understanding of transgenderism. What you do is widely appreciated and is making a difference. Sandra L. Samons, Ph.D., D.C.S.W.